THE SPOTTED HARE: Welcome to a "Wild Hare" day! Welcome to a "Wild Hare" day! Hello . . . I'm so happy you could stop by! Please state preferred payment method as well: Credit Card, Pay Pal or Check. 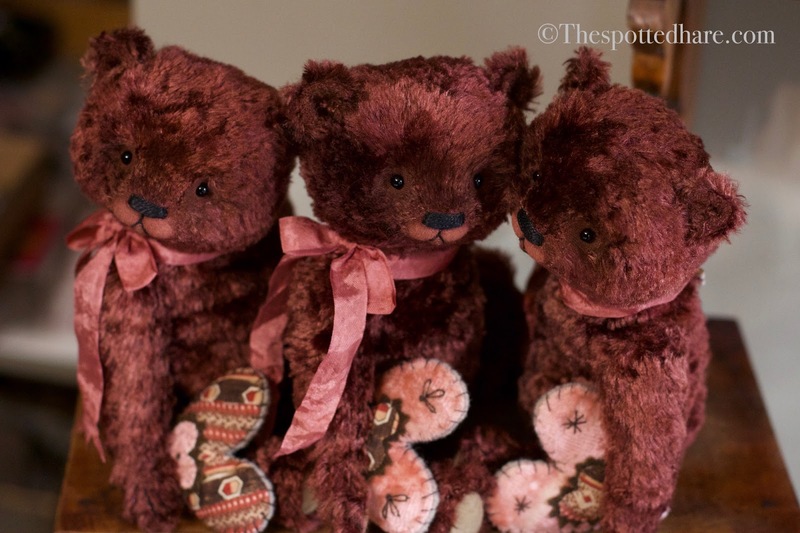 Each sweetie is created from Hand dyed - Antique - Viscose! Not sure I could ever match this color again . . . . we'll call it "Dried Cranberry". It's rich and luscious . . . even more so in person and it catches the light beautifully! Each teddy is 10.5" tall, fully jointed, stuffed squishy and floppy and weighted nicely. Each wears a dirty pink bow and holds a heart of antique fabrics. All SOLD ~ Thank you!